Did you know that? It's not like I thought they DIDN'T have tongues, but it's not like I was running around wondering if they did. Sure, everyone knows hummingbirds have tongues. But other birds? Hawks, chickadees, robins, blue jays, finches, cardinals...they all have tongues! 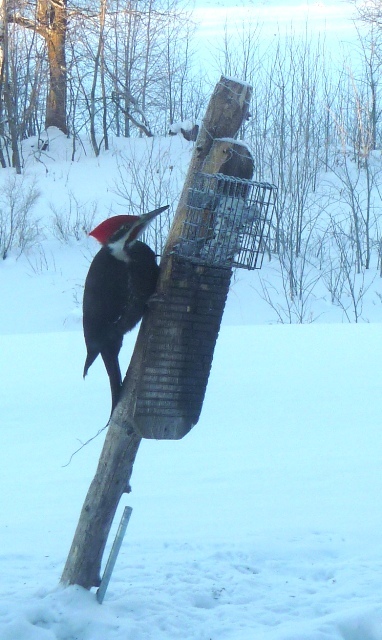 Even the pileated woodpecker, which is what got me onto this whole tongue thing in the first place. Sitting in my aunt's house up north in Bemidji, Minn., a woodpecker the size of Texas landed on one of her bird feeders. "Good god!" I exclaimed, "Look at the size of that woodpecker! And OH-MY-LORD IT HAS A TONGUE!" In all fairness to me, my aunt, a lifetime student of nature, was also a bit taken back by the idea of birds having tongues. Off to her bookshelf she went and returned with a bird encyclopedia and there it was...a whole section devoted to the bird tongue. Like humans, birds use their tongues for food--as a tool to scoop up water, as a probe to dig food out of something, as a way to move food around the mouth, etc. But unlike humans, who use their tongue for speech, birds do not use their tongues in communication. Bird songs simply come from the soul...no tongue necessary! Is this not fascinating? So go ahead, ask the next person you see if they know that birds have tongues and see what happens. I've been doing it all week and it's a hoot (pun intended) to see people's reactions!